Advertising watchdog the Advertising Standards Authority (ASA) has ordered 150 homeopaths operating in the UK to stop claiming they can cure autism. Five of them face prosecution for advertising a treatment called Cease therapy, which has no scientific basis and is potentially harmful. The National Autistic Society says autism is part of who people are and it is wrong to claim that it can be cured. The Society of Homeopaths said the therapy may now be renamed. 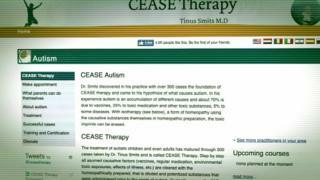 Cease stands for the Complete Elimination of Autism Spectrum Expression. It is a form of homeopathy, based on the idea that toxins in the environment and vaccines may cause autism. Therapists claim they can cure autism by removing these 'harmful' substances with homeopathic remedies and dietary supplements. But there is no scientific evidence for any link between vaccines and autism, and experts say Cease therapy is potentially harmful. Prof Nicola Martin, from London South Bank University, advised the Westminster Commission on autism and said Cease therapy was "based on no scientific foundation whatsoever". "It talks about curing autism; autism is not a disease and not something which needs to be cured. "Psychologically it's really harmful to give parents the idea that the way to love and nurture their autistic child is to try and cure their autism." Cease therapists recommend giving autistic children four to five times more zinc than is recommended by the Department of Health and 200 times more vitamin C, even though large quantities of vitamin C can cause diarrhoea and vomiting. Emma Dalmayne, campaigner against harmful interventions for autism, has been campaigning for five years for legislation against fake cures for autism. "As an autistic adult, it disgusts me that these charlatans are taking advantage of parents," she said. "There needs to be legislation to stop these snake oil salesmen." The ASA's investigation found that 150 Cease therapists breached advertising guidelines that adverts must not falsely claim a product is able to cure an illness or dysfunction. The ASA wrote to them all of them ordering them to stop making claims they can cure autism. The ASA's chief executive, Guy Parker, told Radio 4's You and Yours that they were concerned about misleading and potentially harmful claims on therapists' websites. "We sent out enforcement notices to 150 Cease therapists operating in the UK. We have set out very clearly that they must not make either direct or implied claims in their ads including on their own websites that their therapy can either treat or cure autism. "Those failing to get their houses in order will be targeted with further sanctions." The National Autistic Society said it was pleased that the ASA is taking action against what it called "the bogus claims by people pedalling Cease therapy". Carol Povey, director of the National Autistic Society's Centre for Autism, said: "Autism is lifelong. It's not a disease or an illness. And many autistic people feel that their autism is a core part of their identity. "It is deeply offensive for anyone to claim that unproven and even harmful therapies and products can 'cure' autism - and particularly appalling where people target vulnerable families." The Society of Homeopaths said that some of the terminology surrounding Cease has been misleading and it would take steps to avoid unsubstantiated claims being made.